Cindy Hounsell, JD, is the President of WISER, the Women’s Institute for a Secure Retirement, a nonprofit organization that seeks to improve the opportunities for women to secure retirement income and to educate the public about the inequities that disadvantage women in retirement. WISER was founded in 1996 through a grant the Heinz Family Philanthropies (the personal philanthropy of Teresa Heinz Kerry) to provide low and moderate income women (aged 18 to 65) with basic financial information aimed at helping them take financial control over their lives. Ms. Hounsell provides technical assistance to several national organizations, as well as training to leaders and grassroots advocates around the country as part of her role as director of the National Education and Resource Center for Women and Retirement Planning, funded by the U.S. Administration on Aging. Ms. Hounsell has testified before Congress, served as a delegate for a number of White House Summits and conferences including the last two White House Conferences on Aging, the White House Social Security Conference and each of the National Retirement Saver Summits. 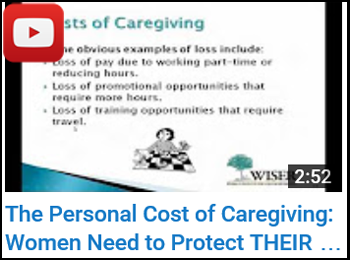 View YouTube clips from recent Retirement Resource Center webinars including Cindy Hounsell’s The Personal Cost of Caregiving: Women Need to Protect THEIR Retirement Too! . In addition to her duties as President of WISER, Ms. Hounsell was recently appointed to the Advisory Panel on Medicare Education (APME) representing the field of retirement and financial planning. She was appointed by Secretary of Labor, Hilda Solis, to the ERISA Advisory Council to represent the general public. Ms. Hounsell was also appointed and served for two years on the Advisory Panel on Medicare Education (APME) representing the field of retirement and financial planning. She serves on the Boards of the National Alliance for Caregiving and STRIVE-DC, as well as on the Advisory Council of Wider Opportunities for Women’s Elder Economic Security Initiative, and the Financial Services Roundtable’s Retirement Advisory Council. Ms. Hounsell is a member of the National Academy of Social Insurance. An attorney and retirement expert, she has been widely quoted in the: New York Times, Washington Post, Los Angeles Times, Boston Globe, Christian Science Monitor, U.S.A Today, Newsweek, Barrons, Investors Business Daily, Congressional Quarterly, Ms., Working Mother, Associated Press, Knight Ridder and Reuters.She has appeared on ABC, CBS, CNN, CNBC, Fox Morning News & Financial News, and a Good Morning America interview with Diane Sawyer. The PBS program, To The Contrary, filmed a two-part award winning series on women and retirement that featured WISER. Radio interviews include several syndicated shows including National Public Radio’s All Things Considered and Marketplace. Money magazine recently honored Cindy Hounsell in its article Heroes, which the magazine describes as “a yearlong celebration of 40 people who have made extraordinary efforts to improve others’ financial well-being.” WISER’s website was also named by ForbesWoman as one of the Top 100 Websites for Women 2012. Click here to read more. Women’s eNews named her as one of 21 Leaders for the 21st Century. Recently, The National Adult Protective Services Association recognized Ms. Hounsell for her leadership and commitment to older women’s issues by presenting her with their 2011 NAPSA Collaboration Award. 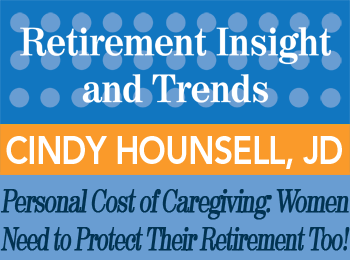 Read a summary transcript of Cindy Hounsell’s presentation The Personal Cost of Caregiving: Women Need to Protect THEIR Retirement Too! in the 3rd Qtr 2013 issue of “Retirement Insight and Trends”. Ms. Hounsell has written several chapters, columns, articles, op-eds, papers and booklets on women and retirement. Two booklets, What Every WOMAN Needs to Know About MONEY and RETIREMENT: A Simple Guide and What Everyone Needs to Know About Money and Retirement, appeared as inserts in Good Housekeeping magazine, to a readership of over 26 million. Visit WISER’s site for more information. Have Cindy Hounsell speak at your event! Cindy Hounsell is one of many experienced speakers and keynote presenters on a variety of topics for your retirement professional development or consumer group. Please contact us today via email or phone 847-686-0440 x102 if you would like to have Cindy Hounsell present at your conference or appear at one of your events, or to receive a free voucher to view a sample of one of our speaker’s work. Find courses and products from Cindy Hounsell at the Retirement Resource Center.